Oh, Microsoft, you’re sneaky! But that’s ok because you’re giving out free swag. 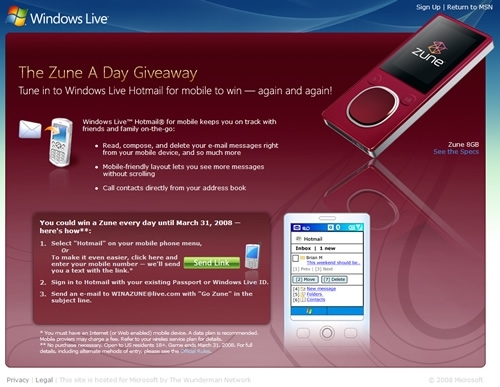 From today until March 31st, Microsoft is giving away a free Zune 8! There is a catch, however. You have to log in via your web enabled phone to Hotmail and send Microsoft an email from there. And that’s how they’re sneaky: pushing Hotmail and the Zune at you all at once. I hope I win! And, well, good luck to the rest of you. Maybe. Good eye, Susan, at Got Zune for spotting this.